When I published this picture (see Yeulett's Photographs Page 1) it generated quite some interest so this page fills in a bit of background to the incident. The pilot was Flight Sub Lieutenant N.E. Williams who also took part in the Tondern Raid and a few years ago I was delighted to be contacted by his son, David Williams. (David, apologies for taking so long to do this page!) who very kindly sent me a copy of his father's logbook. I was also sent a copy of an article by Patrick Mallahan published in the Cross & Cockade journal Volume 26 No.2 which covers this same incident. 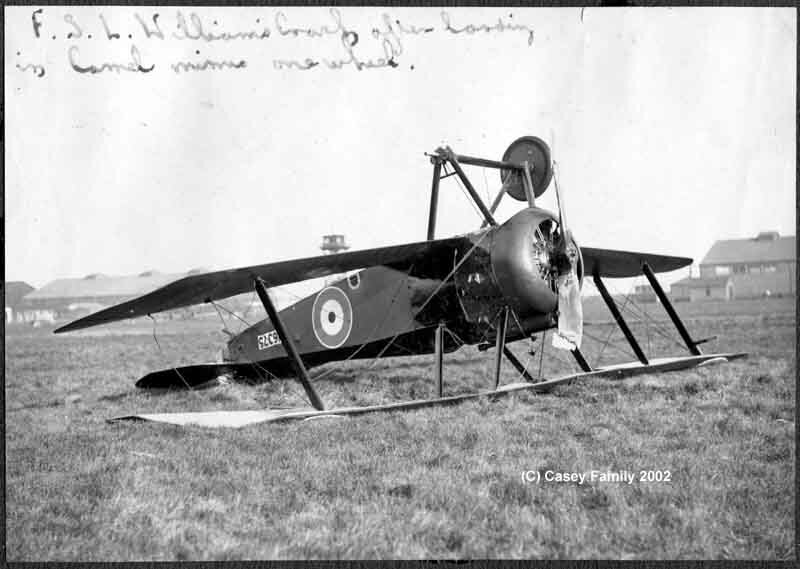 The crash happened on 8th March 1918 at RNAS Isle of Grain. 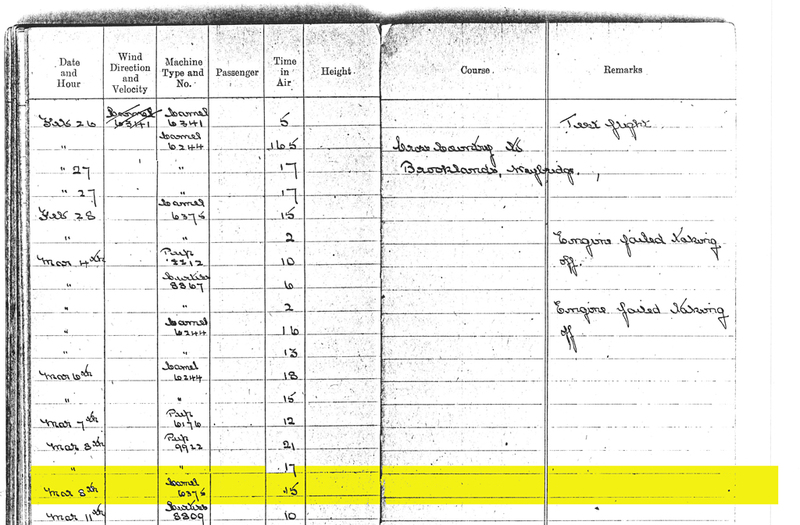 Below is the relevant page from FSL Williams' logbook with this particular flight highlighted. It's interesting to note that no remarks were added regarding the crash, it simply states that a 15 minute flight took place. If you click the image it will take you to a larger copy. It appears that FSL Williams lost the wheel on take off but was totally unaware of it and continued with his flight. As he approached the airfield for landing he had noticed that a number of people were running around on the ground holding wheels above their heads but being unaware that this was the usual signal for a missing wheel he continued his approach with the above result being the inevitable conclusion. Fortunately FSL Williams survived the crash to continue his career and joined the Tondern Raid as reported in another extract from his logbook below (again click the mage for a legible version). It's generally believed that the serial number he recorded for the Tondern raid, N6825, was an error since that aircraft was twice reported as being aboard HMS Furious after the raid. Williams' aircraft was actually destroyed in Denmark after he landed so N6825 cannot be correct unless both the subsequentl surveys were incorrect.